There’s nothing like the thrill of going out on the water and enjoying the exhilaration that comes from owning small power boats. 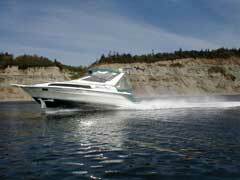 If you are in the market for one, you will find many power boats for sale. The key is to see which power boat manufacturers offer the best models that are most appropriate for you. With this in mind, here are the top ten small power boats. 1. T2 makes some of the best small power boats. The Revel is the perfect example of this as the two-seater is comfortable, stylish and is fast. 2. Cobalt makes top quality boats and has a wide selection ranging from smaller models to larger. Their 200WSS is the perfect combination of innovative features like the Touch Tech system, which stores profiles for skiers with a sharp exterior design. 3. HotDog Powerboats is more than just a fun name. These are very adaptable as you can install a 15-18 hp four strokes engine. This means if price is an issue and you need to find cheap outboard motors, this model is a great option to do this. 4. Stingray is another excellent brand with diverse product offerings. The 185 LS/LX is a fun model that comes with little design touches like a Dino Italian steering wheel. 5. The Saint Martin F-11 Speedboat is small, but packs tons of fun for owners. This is a great boat for areas that have speed restrictions and drivers will find its maneuverability to be superb. 6. Another of their models to make the list is the F-13 Mini Speedboat. It is ideal for those looking for excellent performance and sporty handling. 7. The last model of St Martin’s to make the list is their Harley-Davidson Powered F15. This comes with a monster machine from Harley Davidson called the Crate motor, which will amp up your speed and make this an enjoyable ride. 8. If you want a ride with an electric outboard motor then CraigCat is a good place to visit. They have one called the CraigCat Electric 4-seater that runs on a single charge for up to many hours. 9. Another environmentally friendly option from them is the CraigCat E2 Hybrid. This comes with innovative features like ION docking lights, a LED anchor light and a 55lb thrust electric motor that can run in both fresh and salt waters. 10. The last model to make the list comes from Bayliner as they have a reputation for making luxurious small power boats. Their 160 Bowrider is large enough for a small family yet offers a compact design that will allow you to enjoy the speed of the ride.